Zirconia ultrafiltration membranes are widely developed and used for past several years. But the conventional sol-gel methods of zirconia membrane preparation involve many steps. 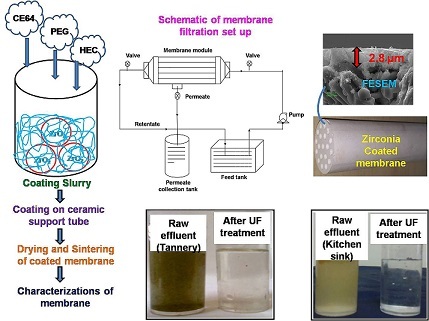 In the present study an attempt was made to develop defect free zirconia ultrafiltration (UF) membrane in single step coating of zirconia nanopowder suspension by slip casting method over multichannel ceramic support. The porous support was made from a novel composition of clay and α-alumina having 19-channels circular configuration. Zirconia UF membrane was developed at the inner surface of the support up to 0.2 m length. Membrane had a mean pore diameter of 40 nm. Clean water permeability of 48 lm-2h-1bar-1 was obtained for the membrane under cross-flow filtration mode. Membrane was utilized for treatment of industrial and domestic wastewater. Membrane treated water was characterized to evaluate the reduction of organic and inorganic contaminants. About 82% and 92% removal of COD were obtained for tannery wastewater and kitchen sink wastewater respectively and turbidity being reduced below 1 NTU for both the effluents. Complete removal of pathogenic organisms was achieved. Membrane treated wastewater may be reused for agricultural purposes. R.J Ciora Jr, P.K.T. Liu, Ceramic membranes for environmental related applications, Fluid/Part. Sep. J. 15 (2003) 51-60. A. Giwa, A. Ogunribid, The applications of membrane operations in the textile industry: a review, Br. J. Appl. Sci. Technol. 2 (2012) 296-310. W.B. Richard, Membrane technology and applications, John Wiley International Editions, 2012. A. Bottino, G. Capannelll, S. Munari, Ultrafiltration for recovery of water borne paints from spray booths effluent, LA Chimica E’ L Industria 65 (1983) 541-544. A.W. Mohammad, C.Y. Ng, Y.P. Lim, G.H. Ng, Ultrafiltration in food processing industry: review on application, membrane fouling and fouling control. Food Bioprocess Technol. 5 (2012) 1143-1156. 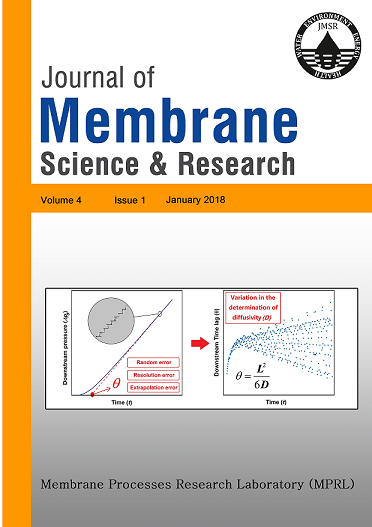 P. Bhattacharya, S. Sarkar, S. Ghosh, S. Majumdar, A. Mukhopadhyay, S. Bandyopadhyay, Potential of ceramic microfiltration and ultrafiltration membranes for the treatment of gray water for an effective reuse, Desalin. Water Treat. (2013) 1-10. A.F. Razi, Ultrafiltration membrane separation for anaerobic wastewater treatment, Water Sci. Technol. 30 (2013) 321-332. J.C-S. Wu, L.-C. Cheng, An improved synthesis of ultrafiltration zirconia membranes via the sol–gel route using alkoxide precursor, J. Membr. Sci. 167 (2000) 253-261. L. Wei, Z. Baoquan, L. Xiufeng, X. Liming, Thermal stability of silica-zirconia membranes, Chinese J. Chem. Eng. 14 (2006) 31-36. M. Niederberger, Nonaqueous sol–gel routes to metal oxide nanoparticles, Acc. Chem. Res. 40 (2007) 793-800. G.C. Sahoo, S.N. Roy, S. Bandyopadhyay, Solvent-coating powder interaction and permeability of coated clay-alumina membrane. Int. J. Sci. Eng. Technol. 2 (2013) 803-806. N. Saffaj, R. Mamouni, A. Laknifli, A. Mouna, S. Alami Younssi, A. Albizane, Efficiency of ultrafitration ceramic membranes for toxic elements removal from wastewaters, Sci. Study Res. Chem. Chem. Eng. 11 (2010) 243-254. S. Bandyopadhyay, D. Kundu, S.N. Roy, B.P. Ghosh, H.S. Maiti, Process for preparing water having an arsenic level of less than 10 PPB, US Patent 7014771, 2006. P. Bhattacharya, S. Ghosh, A. Mukhopadhyay, Combination technology of ceramic microfiltration and biosorbent for treatment and reuse of tannery effluent from different streams: response of defence system in Euphorbia sp. Int .j. Recycl Org. Waste Agric (2013) 1-11. A.E. Greenberg, A.D. Eaton, L.S. Clesceri, E.W. Rice, Standard methods for the examination of water and wastewater, 21th ed., APHA, AWWA, WEF, USA, 2005. R.M. Ayres, D.D. Mara, Analysis of wastewater for use in agriculture– A laboratory manual of parasitological and bacteriological techniques, World Health Organization, Geneva, 1996.
 i Erdem, M. Çiftçioğlu, Influence of calcination temperature on microstructure and surface charge of membrane top layers composed of zirconia nanoparticles. J. Aust. Ceram. Soc. 51 (2015) 134-138. C. S. Kuo, Y.H. Tseng, C.H. Huang, Y.Y. Li, Carbon-containing nano-titania prepared by chemical vapor deposition and its visible-light-responsive photocatalytic activity, J. Mol. Catal. A. 270 (2007) 93-100. S. P. Rao, S.S. Tripathy, A.M. Raichur, Dispersion studies of sub-micron zirconia using Dolapix CE64, Colloid. Surf. A Physicochem. Eng. Asp. 302 (2007) 553-558. W.C.J. Wei, S.C. Wang, F.Y. Ho, Electrokinetic properties of colloidal zirconia powders in aqueous suspension, J. Am. Ceram. Soc. 82 (1999) 3385-3392. L. Saravanan, S. Subramanian, Surface chemical studies on the competitive adsorption of poly(ethylene glycol) and ammonium poly(methacrylate) onto zirconia, Colloid. Surf. A Physicochem. Eng. Asp. 252 (2005) 175-185. M.P. Albano, L.B. Garrido, Processing of yttria-alumina coated silicon nitride slips by slip casting, J. Mater. Synth. Process. 10 (2002) 211-218. R. Greenwood, K. Kendall, Selection of suitable dispersant for aqueous suspensions of Zirconia and Titania powders using acoustophoresis, J. Eur. Ceram. Soc. 19 (1999) 479-488. C. Yang, G. Zhang, N. Xu, J. Shi, Preparation and application in oil-water separation of ZrO2/α-Al2O3 MF membrane, J. Membr. Sci. 142 (1998) 235-243 . M. Qiu, Y. Fan, N. Xu, Preparation of supported zirconia ultrafiltration membranes with the aid of polymeric additives, J. Membr. Sci. 348 (2010) 252–259.